Nothing's better than some vintage sequins. wow girl this outfit is amazing!! Agreed! 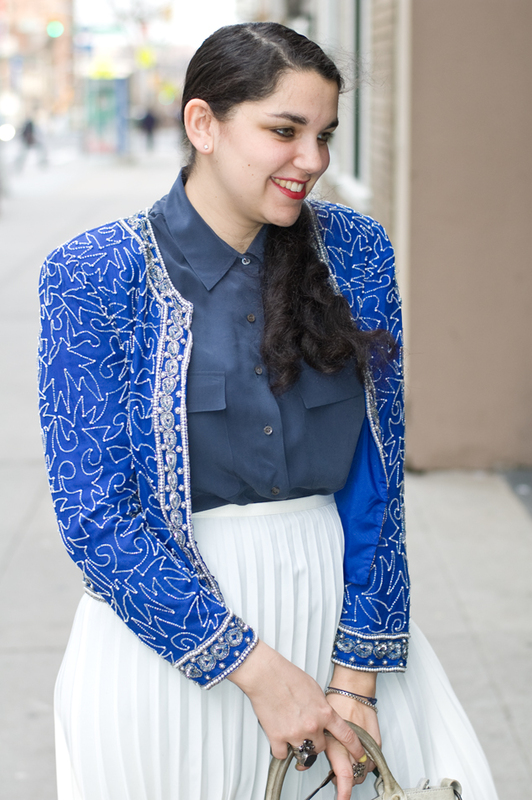 My vintage jackets are my go-to's for jazzing up any ol' ensemble...love it paired with darling pleats! Great mix! You look so cute in that pleated skirt! Love the vintage jacket just beautiful! wow, what a gorgeous look! lvoe your jacket so much! and btw, your header is amazing! That jacket is amazing!! Thanks for stopping by my blog! Lovely outfit - jacket is fab..
yes, got to love vintage sequins! great cobalt color! I'm loving your style here so badly. This sequined bolero is perfection! 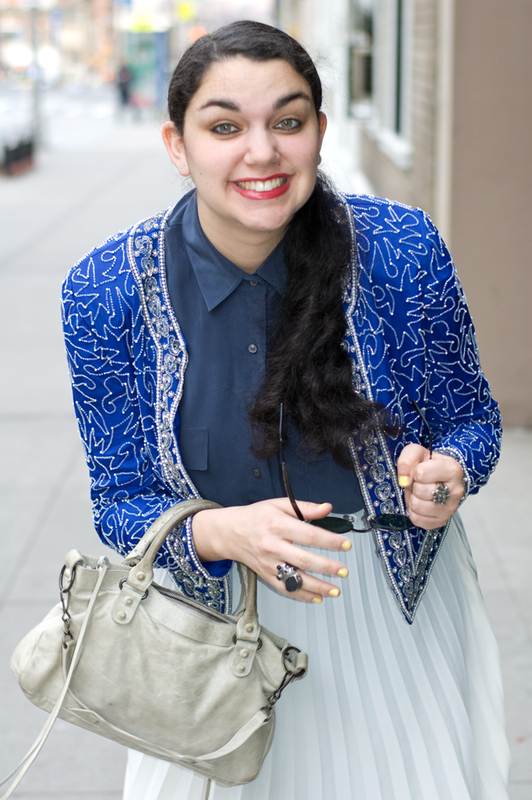 the sequined jacket is super cool! i love it... retro style! Fun jacket, love all the sequins. that vintage jacket is so incredible!! this outfit is great especially with that jacket! I like the vibrant blue color of your jacket. Very pretty. The bolero is so chis! Would you give me your opinion on my fashion drawings by clicking here? Thanks in advance! what an amazing vintage find! and that ring looks beautiful with it! Vintage is the best and you scored big with this jacket! LOVE LOVE LOVE! OH my god. omg omg omg omg omg. I love EVERY single thing about this outfit! I adore it. I've been looking everywhere for a pleated skirt like this - and it is literally the perfect way to lighten up the boloro (which is AHHH mazing). 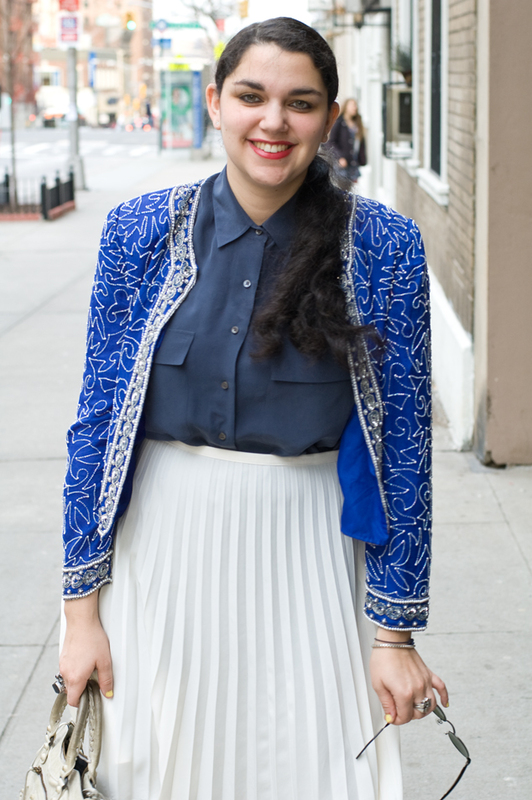 Hi dear, thanks for stopping by :) This is a fantastic look, the bolero is a real statement piece, you look terrific! I'm so impressed with the way you worked this jacket. Awesome! Oh my gosh i love this look...the bolero and the skirt match perfectly! Thank you so much for visiting my blog and for your comment. I would love to follow your blog!